"The perfect blend of coffee and chocolate - a woman's best friends. This delectable treat is a quick, indulgent fix for all your chocolate and coffee cravings. Play with the ingredient ratios to personalize your beverage. Below is the mix I like best. Enjoy!" 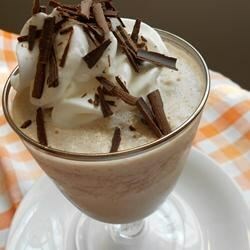 Blend milk, ice cubes, sugar, instant coffee granules, cocoa powder, and vanilla extract in a blender until smooth. Lightly coat the inside of a glass with chocolate syrup. Pour the coffee mixture into the glass. Top with whipped cream to serve. I just made this recipe as written, it was delicious! My husband and I both liked it alot! It was quick and easy! Thanks to the recipe submitter for sharing! This was very good, but my blender is terrible so the last couple servings had big chunks of ice in them... I multiplied the recipe by four for my family drank it up! Delish! Too bitter for my taste. Next time I would cut the cocoa powder in half and add the chocolate syrup to the blender. I was so impressed with how this turned out! I used Starbucks via lightly sweetened instant coffee mix and I skipped on the chocolate syrup in the cup. It was delicious, definitely making again!